(Phys.org) -- Human civilization arose during the relatively balmy climate of the last 10,000 years. Even so, evidence is accumulating that at least two cold spells gripped the northern hemisphere during this time, and that the cooling may have coincided with drought in the tropics. Emerging research on climate during this Holocene period suggests that temperature swings were more common than previously thought, and that climate changes happened on a broad, hemispheric scale. 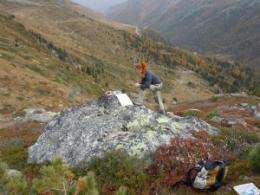 In a new study in Geology, Irene Schimmelpfennig, a postdoctoral researcher at Columbia Universitys Lamont-Doherty Earth Observatory, and her colleagues find that one glacier in the Western Alps was bigger than today during at least two periods in the last 10,000 yearsduring the well-documented Little Ice Age between 1300 AD and 1850 AD, and at an earlier time, from 3,800 to 3,200 years ago. 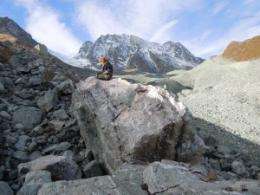 Between 2006 and 2010, Schimmelpfennig and colleagues traveled to Switzerlands Tsidjiore Nouve Glacier to collect rocks dragged downhill by past advancing glaciers. As temperatures warmed and the ice retreated, the ridges of rock or sediment, or moraines, left behind were bombarded by cosmic rays. Schimmelpfennig will continue collecting rocks in the Alps to document Holocene climate shifts at the mid-latitudes. What stopped the Little Ice Age in 1850, and the one in 1200 BC? After a volcan erupts, it blocks out the sun with lots of fine dust. In the case of a series of very large eruptions, or a single ridiculously large eruption, the blockage is so bad that glaciers and sea ice advance dramatically in a matter of just 5 to 10 years. During hte following years, if the dust is still around, or there's another eruption, the albedo is already higher due to the expanded ice and snow packs, and then the sun gets blocked out again by the new eruption, making the cycle twice as bad. 1, The volcanic ash that caused the initial cooling finally fell out of the atmosphere. 2, The accumulated ice from the volcanic winter eventually melted through self-accelerated positive albedo feedback, once the dust was no longer in the atmosphere. This part takes a few centuries. The Santorini eruption fits the date almost exactly. Dating by cosmic ray tracks in quartz grains is awesome whenever it can be used. Um, what? I don't know about "folks" since AGW is the current climate science theory for today's climate. Are you sure you are qualified to comment on a science blog? This fits the AGW model for the current climate, as the Little Ice Age and other deviations from drivers are predictable by the current model. This is a problem only for climate science denialists, which has no explanation for climate that accord with observations. Typically they claim the Sun (which we now know doesn't fit) - these interruptions shows that there are other drivers, hemispheric effects and all. This is inconvenient news for the AGW folks. I don't understand this quote either. Maybe gwrede can explain this to us? While not trying to take sides here, this kind of news does make it harder to convince those who aren't convinced yet. Imagine discussions on the street, where the unsure ask questions like "isn't the current trend just like some little ice age but backwards, so we're getting warmer for some centuries". It would be nice to have a clear and not too complicated answer at hand. With the polarisation of the issue (i.e. people being in the "100% AGW" and the "0% AGW" camps), those in the middle have a harder time understanding what's going on. Of course, "those in the middle" are two groups, the "i guess it's between, maybe more like 50% or something", and those who simply haven't made up their mind yet. Theres no doubt we are contributing to "global warming" but the planet is gonna warm up anyway unless some other catastrophe happens in the future, which is just a matter of time... Don't count on us being the ones to destroy the planet with respect to climate. The natural events of nature which are out of our control will be what causes the drastic changes. if we become extinct it will be nature that caused it. not man. but this whole idea of AGW is a response that keeps us in check. We will not let it happen no matter the politics. We are smart enough to take care of ourselves until something happens out of our control. gwrede: You said: "It would be nice to have a clear and not too complicated answer at hand. With the polarisation of the issue (i.e. people being in the "100% AGW" and the "0% AGW" camps), those in the middle have a harder time understanding what's going on." The reason I didn't give you an answer was that you didn't ask a question. Instead you made a statement: "This is inconvenient news for the AGW folks"
You can read their summary there and their papers if you are interested. In that the track CO2 and volcanos. They have tied specific cold times to specific volcanos. As lurker pointed out, big volcanos can have strong effects. That might not be the answer but it is the best we have now. An initial perturbation (for instance, a major volcanic event) will have downstream effects (alteraltions of ocean currents, alterations of the thermohaline circulation) that continue after the initial event. This makes it difficult to pinpoint the cause of the little ice age. Do not be ashamed of finding science confusing. Climate science is "messy", trying to find trends through the "white noise" of random fluctuations and using climate proxies. However, climate scientists weigh in those uncertainties (just like you can count on quantum physicists to do so) and by the time reports are made in peer-reviewed journals the dross has been filtered out. Unfortunately the oil industry has been following the example of the tobacco industry in sponsoring "junk science" to obfuscate the issue. Media outlets that are affiliated with political allies (Fox news, WSJ) will get generous monetary support, and so on. Just like the cigarette/cancer connection the purpose is to confuse.